UPDATED: Thu., Aug. 31, 2017, 1:42 p.m. The streets are alive with the sound of children. More than 30,000 students begin school Thursday at Spokane Public Schools, and the roads will reflect the raucous new school year. Most kids will be driven to school by their parents, creating a twice-a-day, 10-minute traffic jam all too familiar to motorists. Other kids will take the bus – as long as they live a mile or more away from school. And a slim minority of kids will walk or ride a bike, modes of getting to school that have been nearly abandoned in just a generation. The local health and school districts want to reverse that trend, for health and safety’s sake. 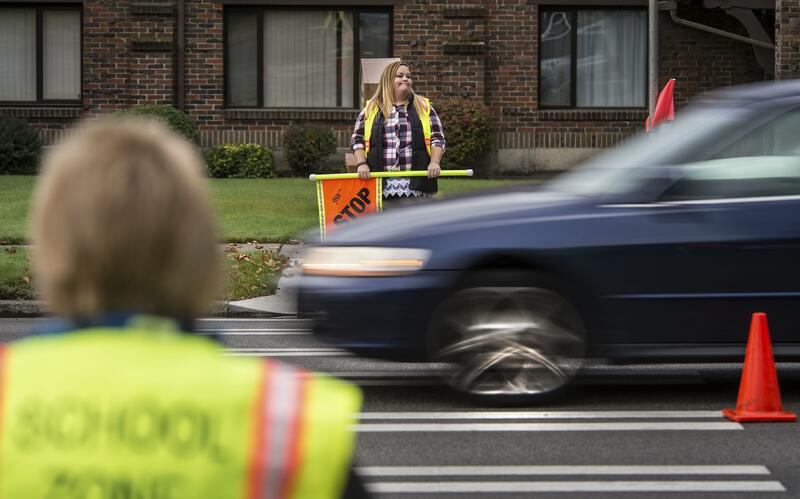 From programs encouraging kids to walk and stricter enforcement of reduced speed zones, to educating children about bicycle safety and better engineering of crosswalks and sidewalks, Spokane is pushing for safer routes to school. One program is an adult-chaperoned group walk called the Walking School Bus. Currently, five local elementary schools have Walking School Bus routes. In all, 95 adults have volunteered to participate in the programs at Holmes, Seth Woodard, Logan, Bemiss and Stevens elementary schools. Participating adults are required to submit to a background check and safety training. It’s a small step toward convincing parents to forgo the car for their kids, something that was once commonplace. Half of students nationwide walked or biked to school in 1969, according to the Pedestrian and Bicycle Information Center. By 2009, that number had dropped to 13 percent. A survey done in 2005 by the Centers for Disease Control and Prevention showed that the car has created a self-perpetuating cycle when it comes to school transport. As more parents drive their kids to school, traffic increases and parents become worried that it’s unsafe for their child to walk to school amid all the traffic. A third of parents surveyed cited traffic-related danger as the main reason they didn’t allow their child to walk or bike to school. Other factors included weather, distance and worries about crime. While kids shifted away from hoofing it to class, childhood obesity rates jumped, from 7 percent in 1980 to 15 percent in 2000, another troubling trend the health district hopes to reverse. The health district recommends children be at least 10 years old before they bike or walk to school by themselves. But if they do, the school district is there to show them how to do it, and to improve sidewalks and bikeways for them. John VanSant, the safety and risk management specialist with the school district, said the school district recently purchased bikes for physical education courses to teach kids how to ride safely. Learning how to balance on two wheels is one thing. Proper use of sidewalks and crosswalks is another, and the school district is making investments in those areas. VanSant pointed to a new sidewalk being built near Regal Elementary in north Spokane. Ridgeview, Shaw and Bemiss elementary schools are also getting upgrades to nearby pedestrian infrastructure, including improved crosswalks, new sidewalks and rebuilt curb ramps. The work at the four schools was done through a $1.3 million Safe Routes to School grant through the state department of transportation. If walking to school is not an option, VanSant has just two words for driving parents: Slow down. “As a safety guy, I’m sorry about the inconvenience, but it’s about safety for the kids,” he said. For motorists with a need for speed, the Spokane Police Department has extra patrols out during the first two weeks of school, as well as speed cameras near two particularly vulnerable elementary schools, Longfellow and Finch. In their first year of operation, the school cameras netted $1.2 million in fines from speeders. “They’ve definitely lowered the speeds,” said patrol Capt. Tom Hendren, who oversees the traffic division. Still, the issues with traffic near the schools persist. “We’ve heard a lot of complaints – frustration from the crossing guards and people picking up their kids,” he said. Hendren said the department is looking to expand the speed camera program to school sites proposed by the Spokane City Council. VanSant agreed, and said he understood life gets in the way of setting a perfect example for your kid, or even being on time. Published: Aug. 31, 2017, 5 a.m. Updated: Aug. 31, 2017, 1:42 p.m.